How great are quesadillas, am I right? Melty cheese, crispy exterior. How can you not love them? For years, Chicken Fajita Quesadillas have made frequent appearances in our regular dinner rotation. Oh yeah, I’ve totally been making this Kraft recipe since before we were even married. I remember whipping up these quesadillas way back when we were college students living in our tiny 1 bedroom apartment on campus. Clearly it’s a household favorite. 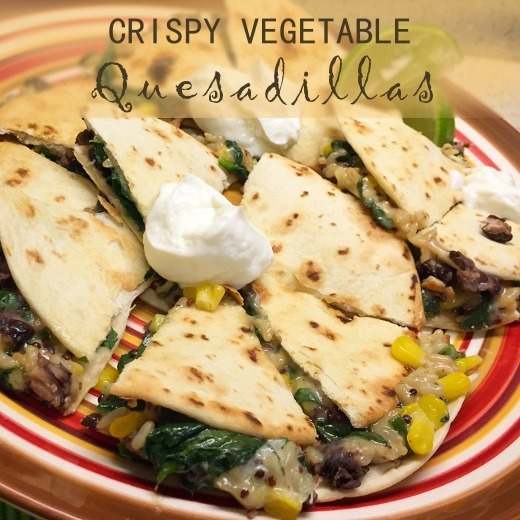 A week or two ago, I strayed from the norm and shook up our quesadilla tradition by trying a new Cooking Light recipe for Crispy Vegetable Quesadillas. I thought they turned out great, so I figured I would share them with you. To make these Crispy Vegetable Quesadillas, you’ll first need a couple of, you guessed it: vegetables. 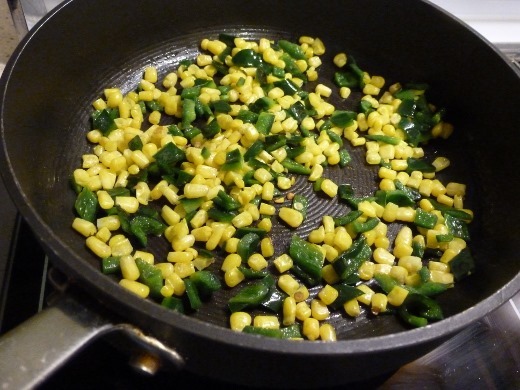 Corn and poblano. You’ll need 1/2 cup of the corn – to keep things easy I used frozen. As for the poblano, the recipe calls for 1 cup of chopped poblano, however I read it incorrectly prior to grocery shopping and bought just one big poblano, which was a bit under 1 cup, but worked just fine. If you’re not into hot foods, don’t let the poblano scare you away. 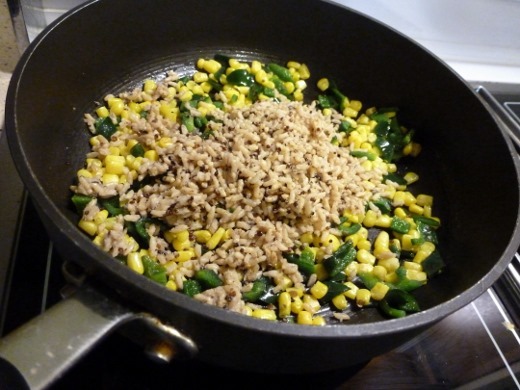 They are really relatively mild,(though there is a bit of variance from pepper to pepper), and lend just a little bit of heat, and crunch, to the dish. If you’re really worried though, you could substitute your favorite color bell pepper, but I’d really encourage you to try using the poblano. I do have one very important tip though: please WEAR GLOVES when chopping up your poblano peppers! Though the poblanos do not taste very hot on your tongue, when you handle the poblano seeds and veins with bare skin, your hands may burn painfully afterward if you don’t wear gloves. Trust me, I know from experience! If you don’t have gloves on hand, you could always place a plastic sandwich bag over your non-dominant hand and carefully use that hand to hold the pepper in place while cutting it with your dominant hand. 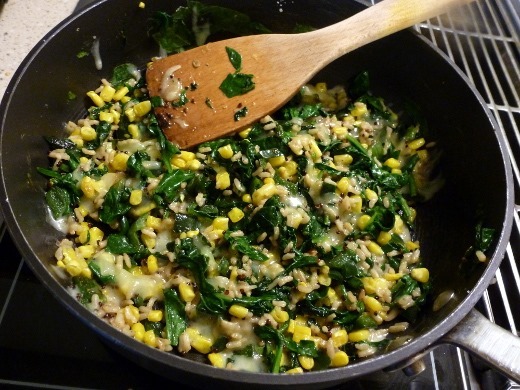 After sautéing the poblano and corn for about 5 minutes, add 3/4 cup precooked quinoa and brown rice (such as Seeds of Change) to the pan. 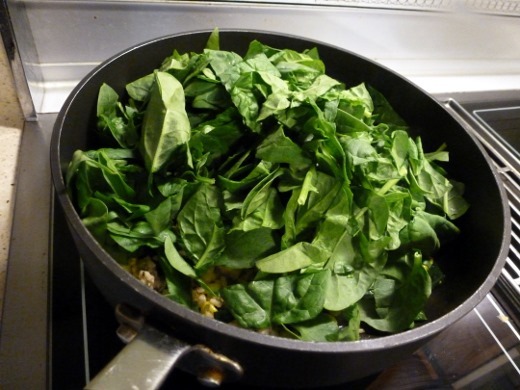 Next, add a 5 ounce bag of spinach to the dish, and season with salt. 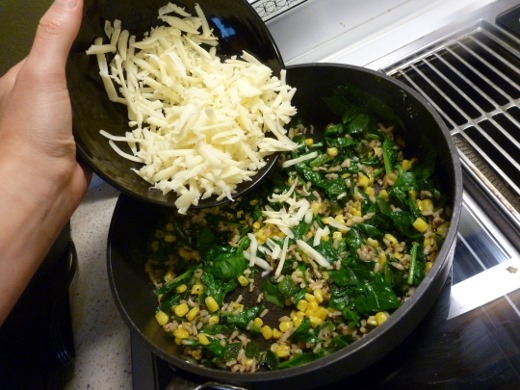 Once the spinach has wilted, move the pan from the heat and stir in 3 ounces of shredded sharp cheddar. I used a tasty sharp white cheddar. I appreciate that this flavorful recipe yields four big quesadillas using only 3 ounces of cheese. This really helps to keep the calories in check. And voila! The cheese and veggie portion of your filling is ready to go. 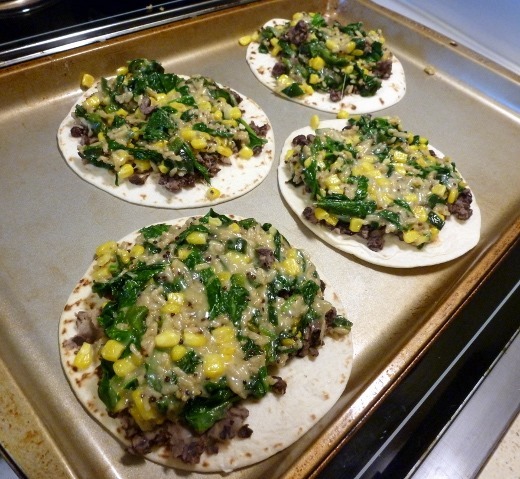 But first, before your quesadillas can accept the cheese and veggie goodness, you’ll need to prep the bean layer. Luckily, this is very easy to do. Rinse and drain a can of black beans, remove one cup, and partially mash them with several dashes of hot sauce. I did this by adding the beans and hot sauce to my mini food processor and pulsing a few times, but of course this could also be done by hand using a fork or masher. 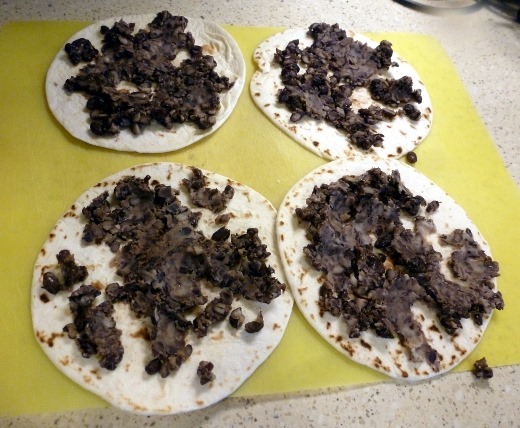 Divide the bean mixture into fourths and spread it gently across four 6-inch flour tortillas. Next divide up the cheese and veggie mixture among the four tortillas by topping the beans with the filling. Finally, top each quesadilla with a second flour tortilla, lightly spritz with cooking spray, and place under the broiler. After a minute or two, take a peek and see how they’re doing. 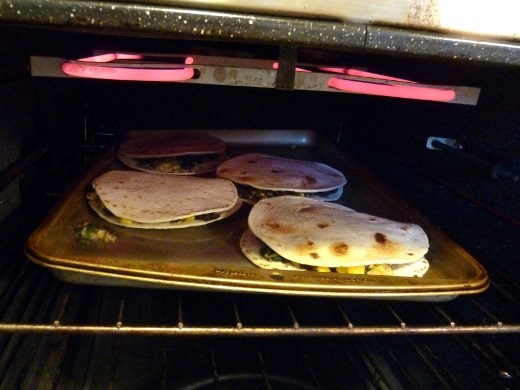 Once the top tortillas have lightly browned, remove the pan from the oven, flip the quesadillas, give another spritz of cooking spray, and place them back under the broiler for another minute or two. Do keep on an eye on these suckers, as they can go from crispy golden brown goodness to charred pretty quickly. 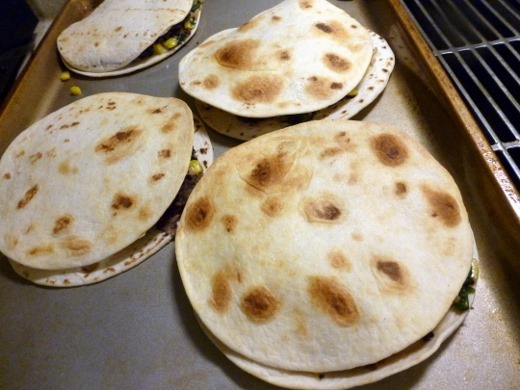 I’ve also found that flour tortillas tend to brown and crisp up more easily than whole wheat, but feel free to use your favorite type of tortilla. 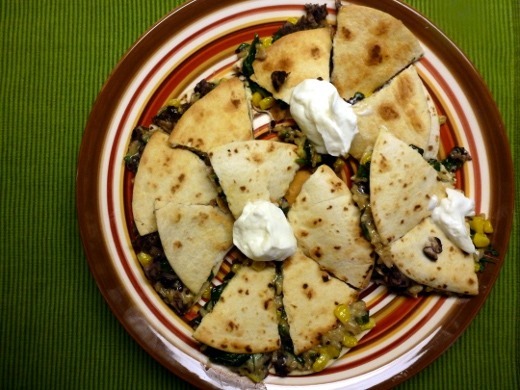 To serve, slice the quesadillas into sixths (or fourths if you prefer) with a pizza cutter or knife and add a dollop of sour cream (or two, or three, like me), for dipping. I thought these quesadillas were fabulous. This recipe was true to the name – they were indeed CRISPY! The cooking spray spritzed onto the tortillas prior to broiling aids in allowing the flour tortillas to crisp in the oven. While the exterior was deliciously golden brown and, yes, crisp, the interior delivered on the melty gooey goodness that is expected of a quesadilla, while also delivering some nutritious elements to your belly as well, in the form of veggies. Shake up your quesadilla game and try ‘em out on your next Meatless Monday. 4. Cut each quesadilla into 6 wedges. Serve with sour cream and lime.